Keeping Texas Healthy - One Banana At A Time! 2019.02.28. "5 Dallas Best-Kept Wellness Secrets", D Magazine. 2019.01.29. "Would you like fresh fruit delivered to your office? ", D Magazine. A simple question for those who wish to create a happy, healthy office. 2018.10.02. "Laughter, Humility, Dedication: The Heart of Community Service", D Magazine. A spotlight on Harvest Project Food Rescue, a Dallas-based grassroots food redistribution organization. ORCHARD At The OFFICE is a proud contributor. 2018.06.07. "20 Questions with ORCHARD At The OFFICE", D Magazine. A basic Q&A to get to know the personalities behind the produce. 2017.12.04. "Getting the Most from your Wellness Program", D Magazine. We give businesses large and small five tips for making effective use of their wellness dollar. 2017.09.22. "Managing Expectations: Providing Superior Customer Service", D Magazine. After seeing a stark example of what not to do, we discuss tips for small business owners who'd like to know how to provide superior customer service, based on what's worked best for us. 2017.08.11. "The Best Banana for the Buck", D Magazine. Our Operations Wiseapple discusses an important principle we adhere to in controlling costs in order to enhance customer service. We hope this helpful tip for small business owners is broadly applicable! 2017.06.30. "A Kindness Is Never Wasted", D Magazine. How commercial real estate and shared office enterprises are gaining a competitive edge by making fresh fruit delivery an amenity for tenants. 2017.05.17. 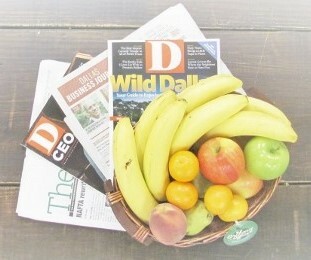 "Healthiest Fruits to Snack on at Work", D Magazine. A special article contributed by Roving Rhubarb Joe Towner about the best fruit options to keep about in the workplace. 2017.01.31. KEXB 620 AM Radio. Operations Wiseapple Chris Buchanan appears with Kathy Ward on "JP, Kathy & The Crew" to discuss ORCHARD At The OFFICE and its successful business model. Here's a link to the video captured for Facebook Live by Kathy. 2016.11.06. ORCHARD At The DRC Half. ORCHARD At The OFFICE provides bananas for all Dallas Running Club races. He's a quick video of the biggest. 2016.09.26. "Take Five! ", D Magazine. How to transform that quick office break into habits for health and happiness. 2016.08.04. "ORCHARD At The OFFICE Summer Giveaway", D Magazine. We participated in this month-long event in which one lucky winner received three months' of office fruit delivery. 2016.05.19. "Benefits of Fresh Fruit In The Workplace", RadioMD (AUDIO). Operations Wiseapple Chris Buchanan discusses the merits of healthy office snacks with Dr. Melanie Cole. 2016.02.26. "Orchard At The Office", D Magazine, Side/Dish Blog.